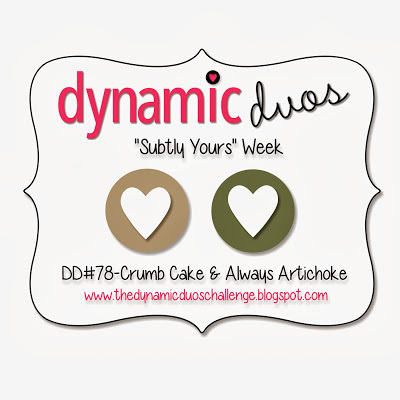 This week at Dynamic Duos, we have a pair of subtle colors. Anyone else have a hard time using more muted colors? They are not my strength! And that’s why it’s called a “challenge”! 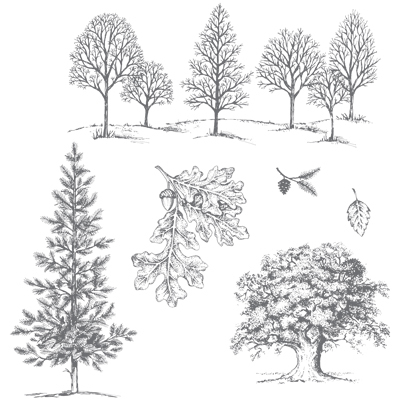 I actually started with the non-Artichoke, non-Crumb Cake embossed tree. 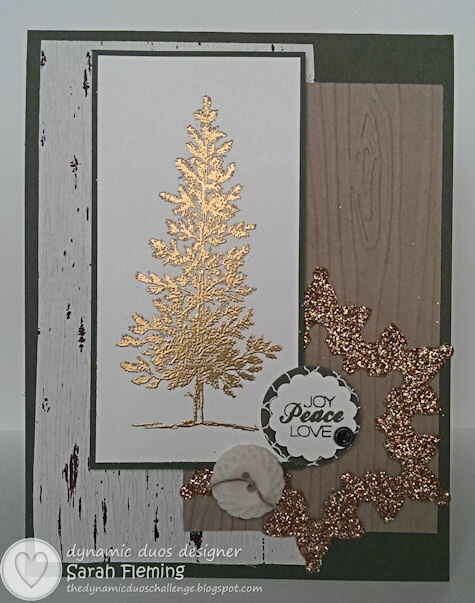 I didn’t mean to start with the metallics, but I had just finished a Christmas cards and tags class where we had embossed this tree in Gold, and I reeeeeally wanted to use it. 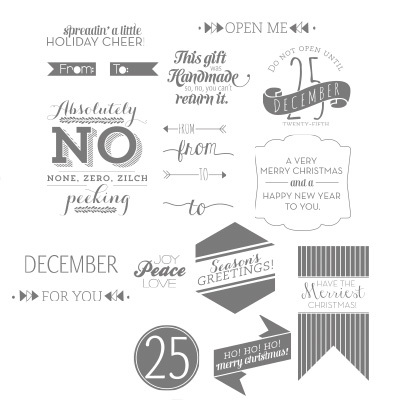 My sentiment (stamped in Always Artichoke) is from the Christmas Tagables photopolymer set that came out last month to accompany the Pop ‘n’ Place easy gift tags. I love so many of the stamps in this set, and it coordinates with so many punches and framelits, so I’ve been using it a lot. I cropped the sentiment with the 7/8″ Scalloped Circle punch, then added a Vintage Trinket and popped it up on a 1″ Circle of Always Artichoke paper from the Regals DSP stack. That wonderful birch paper is from the Thanksgiving Tablescapes kit, and I can’t get enough of it. One thing about that paper, though — it has so much texture that it’s hard to actually adhere using something like a tape runner, so I’d recommend using the Tombow Multipurpose Liquid Glue or maybe Crystal Effects. I haven’t tried either on it, but I know that my little strip is trying to come off my card already, so I’ll need to figure it out before I can mail it! Have you used it? What adhesive did you use? That beautiful snowflake is cut from Champagne Glimmer Paper using two of the framelits from the Festive Flurry set. My final touch is a Very Vintage Button accented with Linen Thread. I hope you like my card. Head on over to Dynamic Duos and the other design team blogs to see the fun, festive, and beautiful cards the other designers have come up with. And please play along — I can’t wait to see your designs! Thanks for stopping by, and have a great Saturday! Love your card with all of the gold embossing and shimmer! The birch paper looks fabulous along with all of your wonderful details! 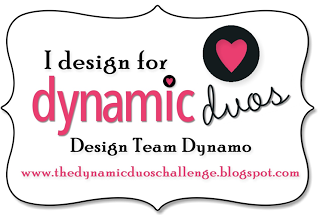 I love seeing your creations and am thankful to be on the DD DesignTeam with you- have a great week! I just love your card. The colours look fantastic together. The star is very eye catching and really finishes the card off beautifully. I love all the embossing. It is beautiful in so many ways! Great job! Your card is gorgeous. Love the embossing. Love your woodsy (but regal) card! My men are in GOT withdrawal until the next season, so your title made me chuckle. The gold worked really well with this more subtle color combo–great choice. Thanks, Caroline! My husband doesn’t watch the show, but he’s read all the books and is waiting who knows how long until the next book comes out.